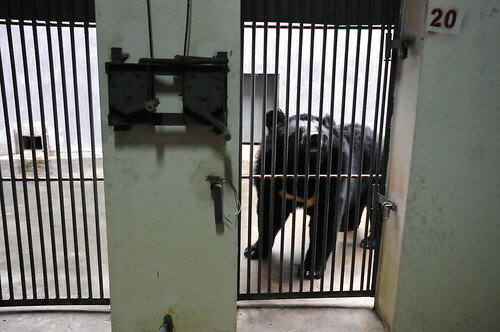 As Animals Asia takes over the care of the bears at the bear bile farm in Nanning, China, the organisation is faced with the huge challenge of turning a place of torture into a place of sanctuary. The process will be a long one, but change can begin immediately. Once the sickest 28 bears have been transferred to our Chengdu sanctuary, the farm will hold 100 bears. Bile extraction may have stopped in 2011 but the legacy of its invasive methods, and the low quality care the bears received remains. Animals Asia will immediately set about correcting the bears’ diets. Rice gruel and corn buns will be changed for a variety of fruit and vegetables supplemented with dog biscuits for protein. A major challenge will be improving the mental health of the bears. Presently, many are exhibiting signs of mental distress. Stereotypical behaviour, the repetition of unnatural actions such as pacing and head swaying, is the clearest sign of this and is being observed in many of the sanctuary’s residents. Recovery can be achieved by introducing physically and mentally stimulating enrichment items and practices to every aspect of the bears’ lives. Enrichment items can include puzzle feeders, climbing structures, strong smelling smears and any other item that allow the bears to exhibit natural behaviours. Please help us turn a bear bile farm into a sanctuary.